MEXICO CITY, Mexico, April 2019 – Last Wednesday, Biz Latin Hub’s Mexico intern Jana Phillips had the opportunity to attend Conversations with ANZMEX: Why Mexico is good for New Zealand companies – The Fisher & Paykel Healthcare Success Story. The event was run in conjunction with New Zealand Trade Enterprise and the New Zealand Embassy in Mexico. 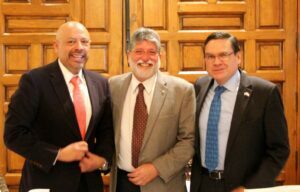 Speaking were Raúl Sánchez, General Director of the Fisher & Paykel Healthcare Mexico Operations, Gerardo Traslosheros, Former Ambassador of Mexico in New Zealand, and Jorge Argüelles, Trade Commissioner at New Zealand Trade and Enterprise. The event drew a variety of ANZMEX members, all with an interest in furthering trade between Australia, New Zealand and Mexico. Left to right: Jorge Argüelles, Raúl Sánchez and Gerardo Traslosheros. The event promoted the success of Fisher and Paykel Healthcare in Mexico, a New Zealand based firm that has set up operations in Tijuana. Fisher & Paykel has been largely successful in Mexico, growing to a team of more than 1000 employees. The company is proud of its low staff turnover, due to sustained investment in the education of its staff and an emphasis on a people-centric corporate culture. Exchanges have occurred between the two countries where staff are able to engage in exchanges to the New Zealand headquarters to secure technical expertise and knowledge transfer. Fisher & Paykel is an example of a successful firm that is driven by the combination of both New Zealand and Mexican capabilities. The company has been able to capitalize on the strengths of both countries while maintaining the autonomy of the Mexico branch operations. Fisher & Paykel was attracted to Tijuana due to its position as a medical instrument manufacturing hub, strategic geographical position and talented staff. Further opportunities exist for other New Zealand businesses to create alliances here in Mexico and explore all the advantages the country holds. ANZMEX (Australia, New Zealand & Mexico Business Council) is a trilateral business platform to provide a forum and support services to explore and promote collaboration between Australia, New Zealand and Mexico. ANZMEX hosts several interesting businesses throughout the year and provides networking opportunities for those in furthering business interest between the three countries. Biz Latin Hub was established in 2014 to support local and foreign companies doing business in Latin America, offering a complete portfolio of commercial representation and back office services. This includes bilingual legal, accounting, finance, taxation, recruitment, commercial representation, market entry and administration services. We’re a one-stop shop to meet the professional needs of businesses operating in the region. Regional offices are owned and managed by an experienced team of local and expat professionals, dedicated to assisting our clients in navigating their way through the complexities of the Latin American business environment. For more information about how we can help you with LATAM market penetration please reach out to [email protected].